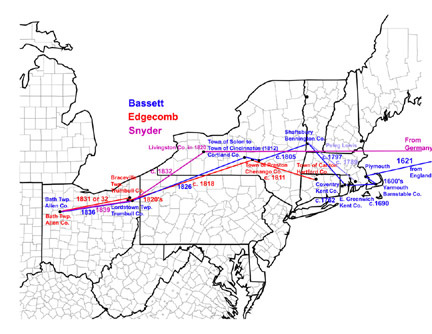 You can get to this website by entering besr.info into your web browser (besr=Bassett-Edgecomb-Snyder Reunion). This website was previously at http://freepages.genealogy.rootsweb.com/~besr/ and may return there if Rootsweb recovers from their hacking incident. How do I get a pdf version of this history? How are these three families connected? 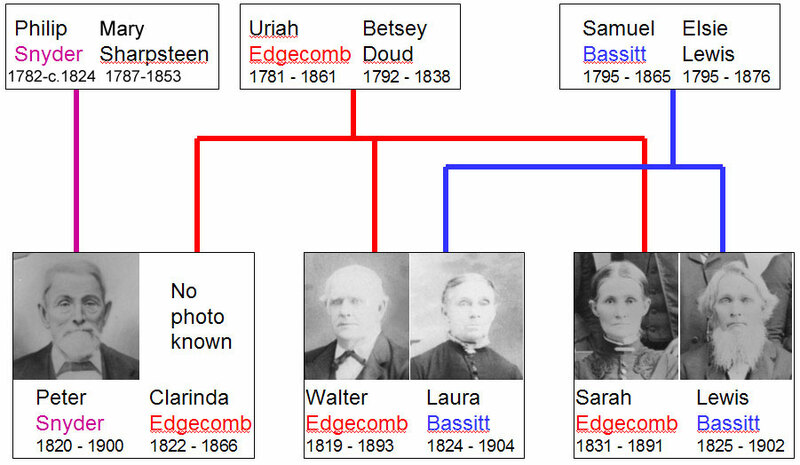 Three of the children of Uriah and Betsey (Doud) Edgecomb lived in northeastern Bath Township, Allen County, Ohio, USA during the latter half of the 1800's. 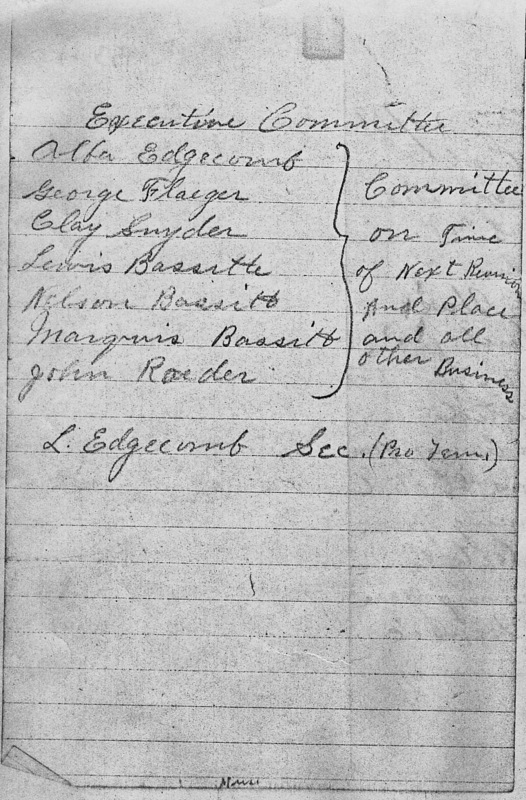 Two married children of Samuel and Elsie (Lewis) Bassitt and the third married Peter Snyder. Many of the children and grandchildren of these three families continued to live in that community and maintained close ties. 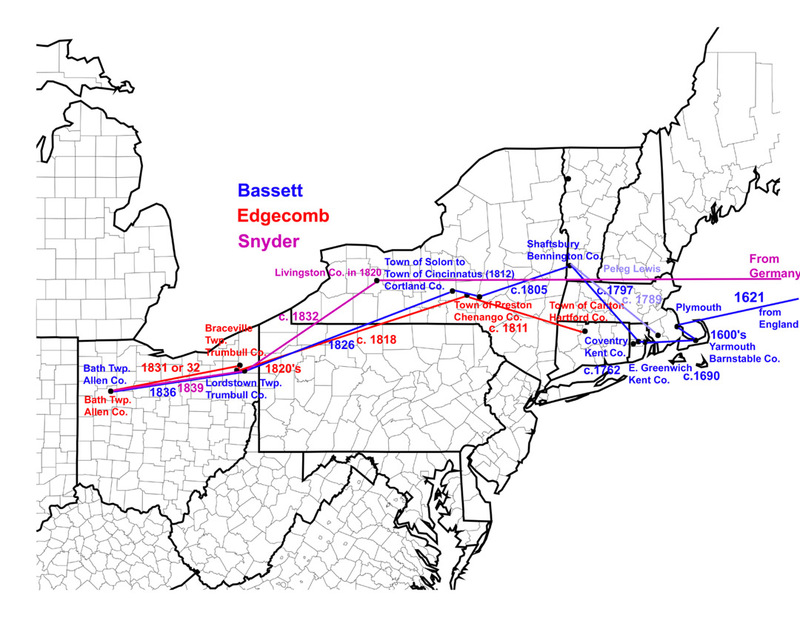 What was the Bassett-Edgecomb-Snyder Reunion? 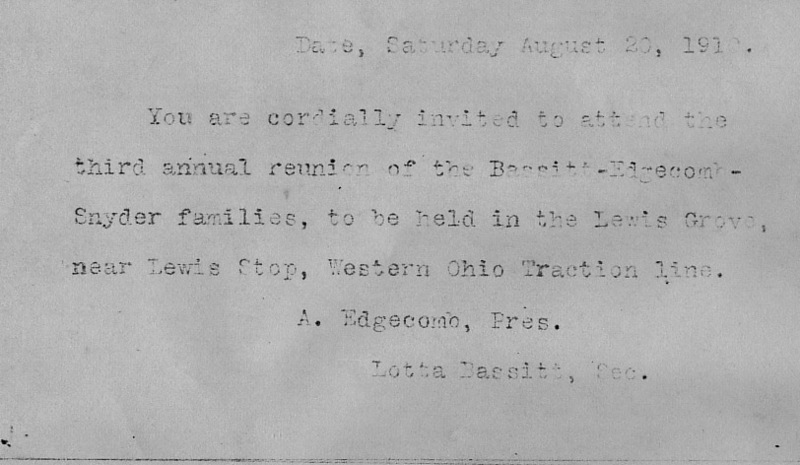 The Bassett-Edgecomb-Snyder Reunion first met at Lewis Grove in rural Bath Township, Allen County, Ohio, USA in 1908. The participants were primarily members of the interconnected families described above. View notes from the first reunion. 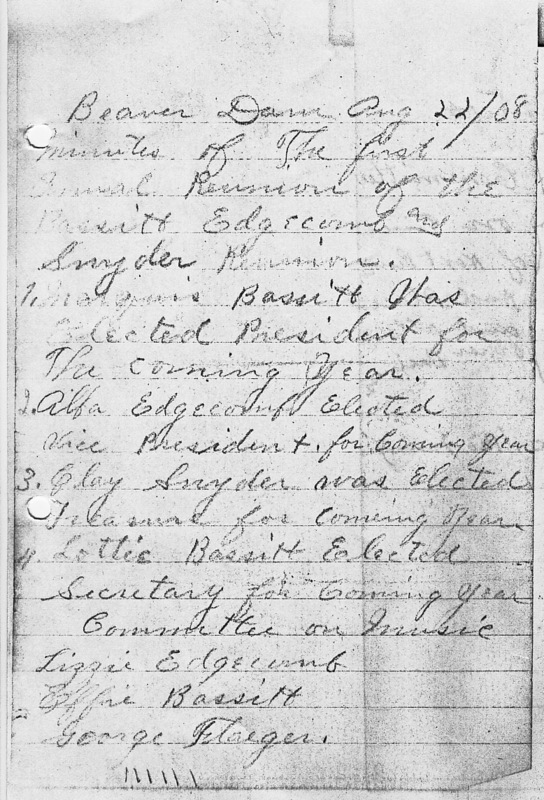 Page two. The organization meet yearly in the Lima, Ohio area on the second Sunday of August for 100 years. Post card from the third reunion (1910). Post card from the tenth reunion (1917). Post card from the twelfth reunion (1919). 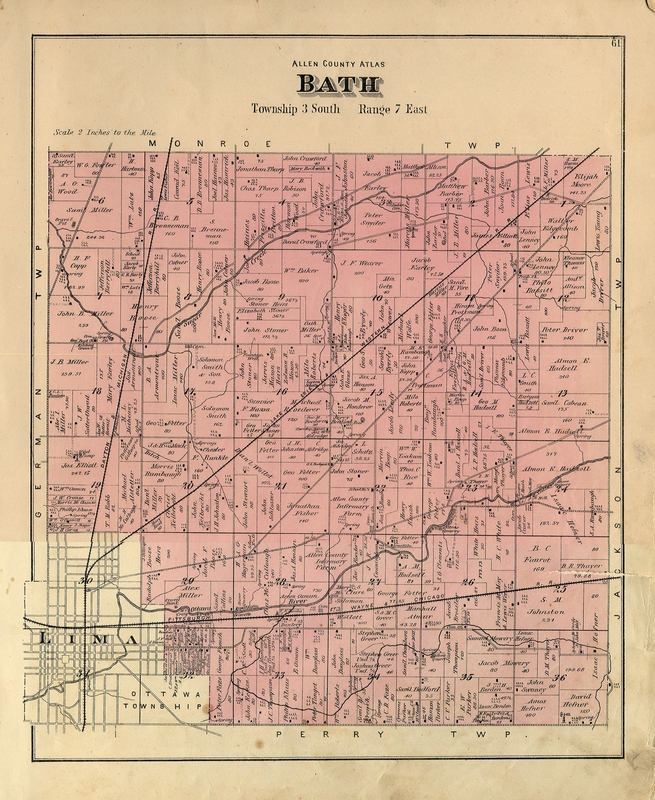 Tour of Bassett-Edgecomb-Snyder historical places and cemeteries in the vicinity of Lima, Allen County, Ohio. At the 100th Reunion in 2007 it was decided to discontinue the annual reunions, but to establish a presence on the Web where those interested in the family history could maintain contact, and where historical and genealogical information and documents could be archived and made available to anyone who was interested.